StarWind V2V Converter makes migration between different hardware sets easier, supporting Windows Repair Mode during conversion to VHDX. This way the VM automatically adapts to the given hardware environment, negating any compatibility problems. StarWind V2V Converter works with all the most commonly used VM formats: VMDK, VHD/VHDX, StarWind native IMG, QCOW. It works both ways, converting from and to any selected format, thus having better functionality than similar converters. StarWind V2V Converter allows easily converting VM formats directly from one hypervisor to another. You don’t need to create the copies of the source and destination VM files on your local machine, making the conversion process extra simple. StarWind V2V Converter supports all industry-standard hypervisors including Microsoft Hyper-V, VMware ESXi, Citrix XenServer, and KVM (coming soon). By converting VMs from and to any selected format, it allows easily migrating between different hypervisors. 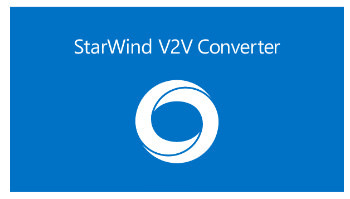 StarWind V2V Converter is a tool that allows the conversion and cloning of VMs from one format to another and is utilized when migration or hypervisor switch is required. Compared to typical converters built into hypervisors, StarWind V2V Converter performs bi-directional conversion between multiple VM formats. The software supports the most widely used formats: VMDK, VHD/VHDX (Windows Repair Mode aware), StarWind native IMG and QCOW. The interface of the application is represented by a wizard-like layout where you can follow a few simple steps to get a task done. Loading a source file into the working environment can be done by using only the file browser, since “drag and drop” is not supported; you can check out the format and size for the respective item. In the next step, you can establish the image format for the output files, between VMWare growable, pre-allocated or ESX server image, MS Virtual PC growable or pre-allocated image, and Raw image. In case of any of the first two options, you can select the virtual disk type between IDE and SCSI. After specifying the output directory and filename, you can proceed with the conversion procedure and, during this time, you can view log details. StarWind Software V2V Image Converter uses a pretty low quantity of system memory and CPU, has a good response time and takes a reasonable amount of time to complete a job. No error dialogs have been shown in our testing and the program did not hang or crash. All in all, StarWind Software V2V Image Converter provides a simple solution when it comes to disk image conversion, regardless of the user’s skill level.